Hobby Tip #1: Enlist your wife! I've been playing Warhammer 40K since 1989. Since then, I've collected just about every army and painted much of every codex. In the beginning, it was just about getting paint on models, but then I started going to Games Workshop GTs. After winning Best General at 5 GW GTs in a row, it was obvious I needed more than perfect battle and perfect sports to win that coveted Best Overall! 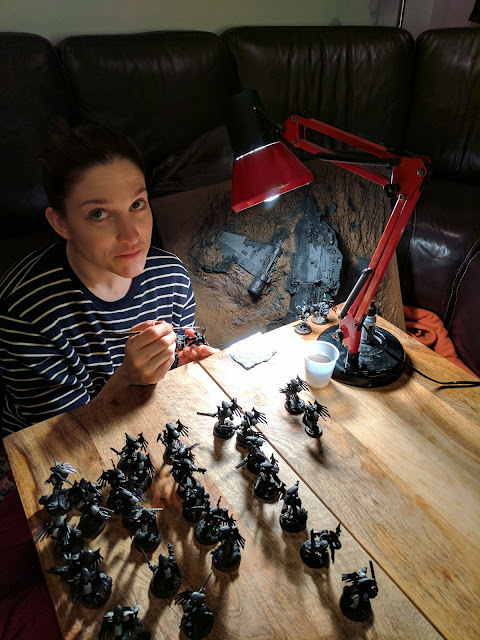 So I started to become serious about modeling, converting and painting. Over the years I have taken on converting, sculpting with kneadatite, making molds is latex, casting in resin, building display boards and air brushing. Nowadays, I've largely stopped competitive gaming and I focus more on the rule of cool. But at any level of competition, playing with awesome models makes for more awesome games.